The Sallie House in Atchison, Kansas quickly earned a national reputation as one of the most haunted places in the U.S. — almost certainly the most haunted in the state of Kansas. The rather simple-looking painted brick house at 508 N. Second Street, built between 1867 and 1871, gives no indication from the street of its spooky reputation, but the many experiences of those who lived there are have subsequently investigated the place testify as to its ghostly vibes — mostly of the negative kind. Strangely melted candles and burnt finger marks. Tony had an actual sighting of Sallie on Halloween morning, 1993. While napping, Tony heard of woman’s voice say, “Here’s your remote,” as the TV remote control was placed on his chest by unseen hands. During the first Sightings taping, Tony received three bloody scratches on his arm. 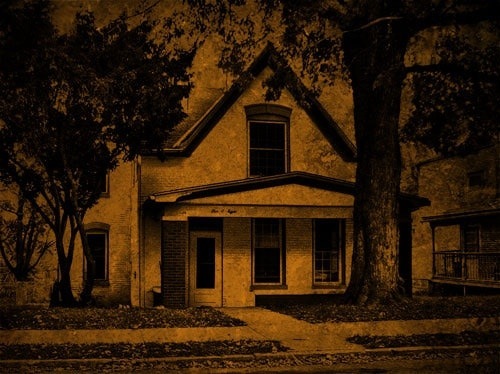 The Kansas Parnaormal Group has extensively researched and investigated the Sallie House over the years and may be primarily responsible for labeling the haunting as “probably demonic” because of the many violent incidents.